Surprised, I awkwardly turned, thinking that I had heard someone at my office door. But upon inspection, no one was there; just the unrelenting roar of the factory. Over the months that I had worked at my job, the roar and vibration of the factory had become invisible to me and what brought me conscious of it again were the times when I would hear or feel things that were different than the norm. And what I had just heard from my desk was something different than the norm. “There it is again,” I said to myself and again I turned quickly to the door. 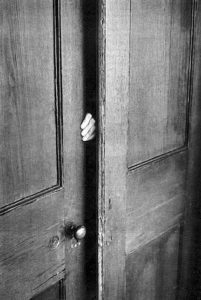 But this time I said, “Is someone out there?” With that question I saw some fingers grab the door and begin to pull it open. And then the figure of a person, Joe, moved slowly into view. “Come on in, Joe. Sit down, make yourself at home,” I said to him. “Don”, I said to him. As I asked him a series of clarification questions to get the location and such, he was visibly positioning himself to turn and leave. He was uncomfortable; I could see his shaking accelerate and beads of sweat form and begin their downward trek on his forehead. When I finally thanked him for telling me, he immediately turned and hurried out of my office, three or four times faster than when he came in. I sat back and just reflected on what had happened. Over the year or two that I had been working at this plant, Joe had never come to my office and over the months hadn’t said more than a couple of words to me. I just assumed he wasn’t the conversationalist type. He was a great worker, just quiet. But something was different this time about Joe. Yea, he was quiet, kind of passive, and quite awkward in my office for sure. But what caught my eye was the quiver in his voice and hands as he explained the problem and why it “should be replaced sometime”. Why was he shaking? Why were beads of perspiration rolling down his face? Why was he so uncomfortable about a couple cracks in a pipe? And then I figured it out; “…sometime” didn’t mean anytime; he was trying to tell me that it needed replaced now. He couldn’t say it verbally in an assertive fashion probably because of my “big title”, but his body language was clear upon reflection. Having realized his “passive intensity”, I immediately went down to check the pipe. It was bad. I had the system shut down immediately. And we kept the system down until it was fixed. Why? Failure of the pipe would have exposed many people to a hazard and would have put the plant down for at least a 2 days. I found Joe later and thanked him. He probably prevented a lot of people from being hurt and he prevented a major downtime event from occurring. I’m just thankful that it occurred to me that he was communicating something important no matter how awkwardly or passively the message was delivered. I believe there are a lot of “Joes” out there. They have a message, but just don’t have the clear, assertive voice that often needs to be heard by many managers and leaders who don’t listen well. And as a result these managers and leaders often make disastrous decisions because they didn’t take the time to discern what the other was trying to communicate in their own unique and often ineffective fashion. Consider the many meetings we have and the diverse set of “Joes” that might be in these meetings. Whether they are strategic planning meetings, budget variance analysis meetings, project post audit meetings, staff meetings, or other important discussions, there are most likely people like my friend Joe in the room. Consider how they are afraid to say what they need to say, who will not say anything contentious, who when they know they need to speak come across awkwardly, passively, or wimpy. And consider the risk of not hearing or understanding the true intent, seriousness, and intensity of what they may be trying to communicate. Yea, I know, you belief you have the personality that wouldn’t constrain anyone from speaking. And yes, you may be right. What you forgot is that it is not about your personality; it’s about other things like your title, your celebrity status, or the power they perceive that you have over them that constrains assertiveness and simultaneously hides your personality. If you lead, if you manage, if you have a big title, if you tend to be in a hurry, entertain this suggestion. Slow down and be civil and courteous. Listen with your ears, listen with your eyes, and respond by paraphrasing what was said to show understanding. Speak last after you have experienced extended times of silence and only respond with your opinion after you are sure that you understand your people first. Create this environment so that people have the time to form their thoughts, time to organize how to communicate their thoughts, and have taken enough time to build the courage to boldly say what is on their minds. Look for that “passive intensity”. You will be surprised by how much more you will know about your organization’s situation and by how much more effective your decision making becomes.